The h-208 is a unique loudspeaker that provides what we believe to be the most output available in any system less than 12 inches in height. The h-208 combines a full complement of VUE’s most advanced transducer technologies, with powerful onboard VUEDrive system electronics, into a low-profile configuration ideal for low-ceiling applications where output and fidelity are critical. Like all h-Class systems, the h-208 was designed with a “no-compromises” design philosophy, VUE’s h-Class engineering team re-examined every single element of the loudspeaker equation, and then applied our most advanced technologies to deliver measurable improvements in clarity, frequency response and SPL. From their precision-engineered transducers with cutting-edge diaphragm materials and suspension components to their highly sophisticated active electronics and digital signal processing, every element of an h-Class system was optimized to deliver unparalleled sonic performance. The two-way h-208 combines a pair of precision-engineered, three-inch voice coil 8-inch LF transducers with a horn-loaded compression driver that features a Truextent™ beryllium diaphragm at its core. The h-208 can be used alone or on top of a subwoofer pointing forward (90 degrees relative to the floor) or hung using its yoke bracket to the precise angle required for a specific application. The h-208 can be hung from the ceiling at steep angles while maintaining very low overall height due to the slant at the back of the enclosure’s top. 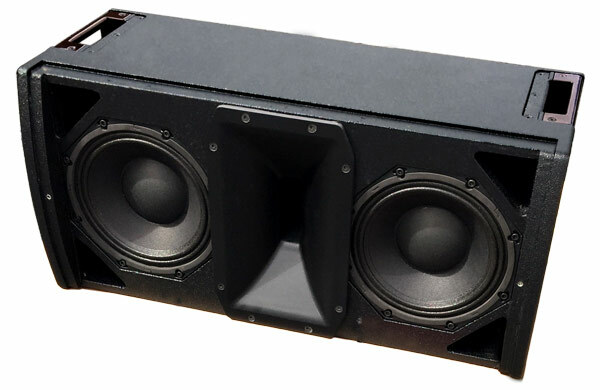 The unique shape of the h-208 also permits its use as a very high output stage monitor for applications where stage depth is limited but performance cannot be compromised. The h-208 also includes a built-in pole mount along with the yoke assembly, which allows easy deployment as a main system, or in a variety of support configurations. 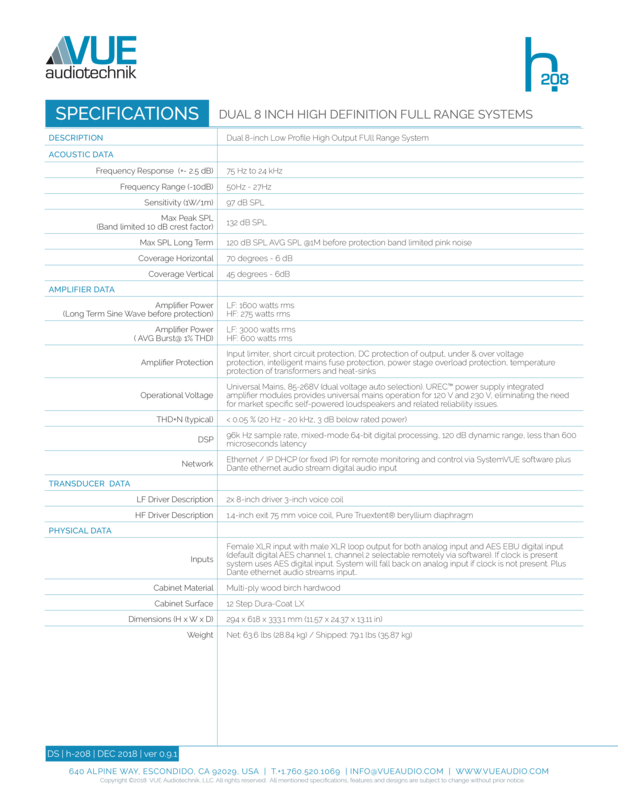 Finally, every h-Class model ships with networking capabilities built-in right out of the box. And since VUE’s network technology relies on standard IP protocols, setup is a breeze. SystemVUE software (available free on Windows, MacOS, and iPad on iOS) provides control and monitoring capabilities through a highly intuitive and powerful user interface. The h-208 also includes as standard support for Dante network audio streams in addition to AES/EBU digital and analog inputs. The h-208 active two-way system employs a compression driver featuring a revolutionary Truextent™ beryllium diaphragm at its core. 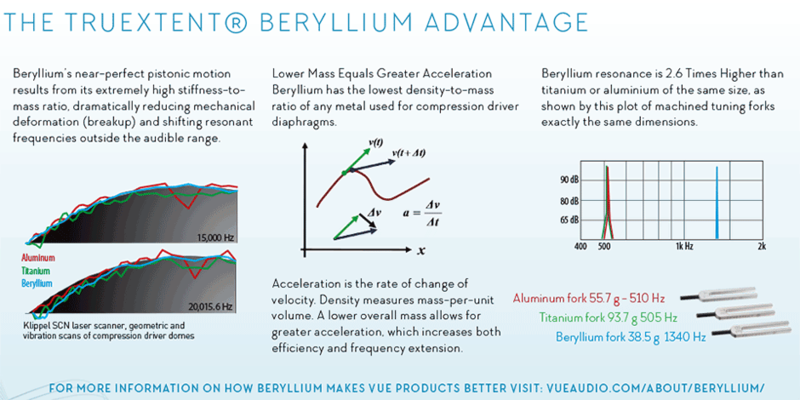 Beryllium outperforms both aluminum and titanium thanks to an extremely high stiffness-to-mass ratio, which dramatically reduces mechanical deformation (breakup) and shifts resonant frequencies outside the audible range. The 3-inch coil driver is VUE’s third generation of beryllium drivers incorporating a totally new phase plug designed to extend high-frequency response enabling output up to 28k Hz. The use of beryllium enables more extended high-frequency response with lower harmonic distortion and less time smearing (impulse accuracy). The net result is unmatched clarity and detail at high frequencies that sound more like a high-end audiophile HiFi system than a very high output sound reinforcement system. The unique compression driver is mated to a pair of equally capable cone transducers that are also designed and manufactured by VUE. 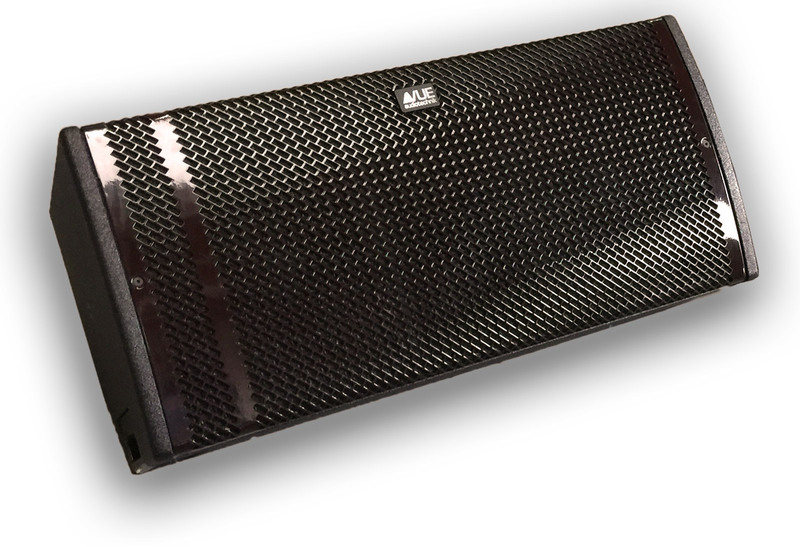 The woofers are a variation of the 8-inch drivers developed for the al-8 Acoustic Linearity Line Array with a different voice coil optimized for use in the h-208’s enclosure while providing exactly the right impedance for maximum performance from the built-in amplifier. These precision-engineered 8-inch transducers utilize a large, 3-inch (75 mm) voice coil to dramatically increase power handling while minimizing power compression losses. An impregnated linen surround, curvilinear cone, and high coercivity ferrite magnet bring exceptional durability and ensure years of reliable service under the most severe conditions. 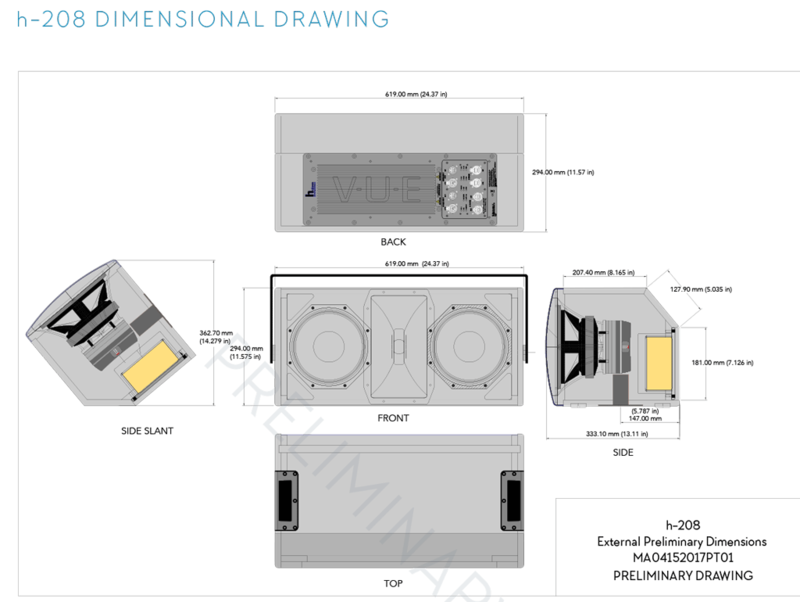 The h-208 is fitted with a 2-channel, high-efficiency power amplifier module that provides ample power for both transducers while eliminating the need for noisy cooling fans. A lightweight, fully protected switch mode power supply with auto voltage detection provides hassle-free worldwide operation with universal mains operation from 85V to 260V.